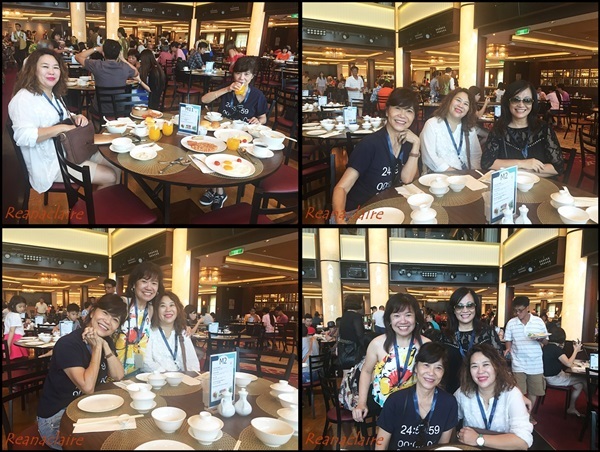 We tried out the few restaurants provided for us, one morning it was a fusion of western and asian, and on another day, we tasted their set of Dim Sum too. There is a total of 4 venues to choose from and the best of the best is still the International Buffet where there is a wider spread of food to choose from. AS we are good eaters, we prefer more choices... LOL..
Our server for two days.. nice and friendly.. The prawns if fresh should be very tasty! I too would prefer the international buffet. OMG! I have to book a cruise soon. I know their buffets and restaurants serve only the best. It's heavens to dine and look out at the vast oceans through their Windows. Your life is always so good blessings. Happy for you Claire. Wow, it is all gorgeous food! And the server is so thin, even with all this food around! Wonder if the staff gets to eat for free? Another reason why I would never go on a cruise - they say there are so many things to eat, all day. Good grief! I would grow so fat I would sink the ship. LOL!!! Aiyoh! A feast onboard. I definitely gain more if eat like that everyday. So much food to enjoy on the cruise!